Being aware of each and everything being said about you is hard, but making the world believing that “you are aware of each tiny thing and will be aware if you say something however small”, is something the world is learning from WomWorld and Nokia today. Hats off you guys … sometimes I think that I will be proud if one of my future son (I am unmarried till now 😉 ) shows me an offer letter from 1000heads or Womworld. That’s what Connecting people is all about, not just renaming some existing technology. It’s always hard to remember the moments with your ex-dates, sometimes your mistakes, sometimes the situations and sometimes … you still don’t understand that what went wrong. Remembering the dates with an EX in past … even the idea … make you go blank. Obviously, I am not going to talk about girls, which could have been an impossible job for sure. This post has reference with the WomWorld/Nokia initiative in welfare of DATE Sufferers. Our research also shows that this affliction is becoming increasingly prevalent. Because the WOMWorld/Nokia trial programme has been steadily growing across the globe in recent years. This is, of course, great news… but it does mean the spread of DATE is likely to widen. To try and combat this inevitable consequence, we’re putting together a cure for the very biggest DATE sufferer out there. We’re offering the chance to WIN one of our ex trial N97 mini devices – and will award this device to whoever needs it most. You have until Monday August 2nd to enter. So… Good luck DATE sufferers. We know this could rekindle some painful memories. Just think of the closure. Why I am a big time DATE Sufferer? Yes! We all know that before getting a DHL parcel, we will get an email from our 21st Century Santas Paul and Katie, but still we wish that sometimes they may surprise us like they did once with me. I really has said this to @WomWorldNokia that you people have got us all spoiled now. Ghost Handset Syndrome… Yes! I feel myself playing with N9 or E7 whatever … and sometimes even tablets like iPad running a glossy and our superb fast Maemo (I am saying Maemo). 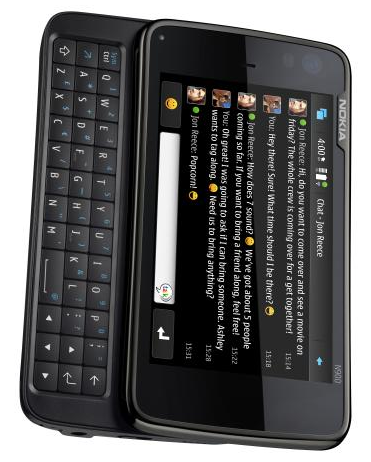 I really feel it doesn’t matter to me, if there is Multi-touch or not till its super silky and real productive like Nokia N900. Yeah!! you called it Ghost handset syndrome, we know that nothing such exists and may be never, but still dreams are dreams.. we wish if we were working for Nokia and were allowed to design one … sigh!!! Day dreaming … perhaps WomWorld/Nokia made this word non-existent. Who believed that someday one will write a mail to him that we could send you a 500$ – 600$ dream device for trialing? It was a real day dream to me when Paul wrote me for first time. I swear I didn’t believed, even when he sent me the trial agreement, I was saying to my friend, is this can be real? Still we feel that its some Inception kind of world, where WomWorld/ Nokia is playing Leonardo DiCaprio. Is it what you call Day dream? Pretending… There was a line in some movie that if we don’t get a girl, then we fake it among our friends like telling them she said this, she said that.. we know its wrong and we stop saying once get more serious into it, but still… when you desperately wants something and see everyone else is getting the same, then you find yourself without any choice than talking so confidently about the unseen devices in a way that other may think that you got a hold on it. Special kudos!! to WomWorld to find this symptom as it was the most hard syndrome to be found. One more syndrome, which WomWorld missed to mention is Syndrome of togetherness with Nokia. All of sudden, we feel like that its our right to say on things like, how Nokia should do this or how they should have done that. We say because we know that each word get heard, each and every buzz … even if most random, even if from the most tiny guy … it doesn’t matter what we are, it doesn’t matter, what we contributed or could contribute in growth of Nokia, but still we feel close that they feel us as family members. Yes!! 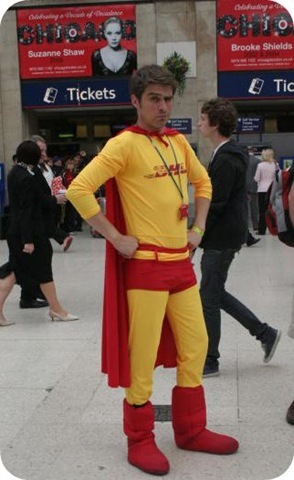 I said it… I am the DATE Sufferer and I am the worst of them. It already a long post now, but still when started then can’t hold me back to write about my past “dates” and yes!! they include few Non-Nokia as well. My First ever Phone: My first job, when I was in my third semesters of my course, joined as a hobby that time and while all of my salary was kind of bonus to me, the first purchase of my life with my own money was my first phone LG Moonlight from Reliance. It was sleek, it was simple, but prime reason of purchase was “It was a reliance, a CDMA”. CDMA was new hope was internet savvy people in those times. EDGE wasn’t that big heard of, neither Data plans were that nice to you. A 3.6 k INR device with nominal charges for internet once you connect it to your PC was the perfect deal, for we newbie . It was cool.. as I was able to watch News items videos like Aajtak on my handset itself, even if that was not colored. (Hoping to bring back better days with Nokia N8 webTV) I was happy and was waiting to find time that when I will go market to buy a Data Cable and will be able to access internet on my PC. END was the worse part, when I lost it within a month, when going to market with some friends for puncture repair of my bicycle. Once I realized, we all running here and there and searching for the same, but ….. So, I lost my first phone just in few weeks after buying it and without using it once for the purpose I bought it. That set was sure something… been with me for six-seven month and I can’t tell you that how badly treated that one was… got accidently thrown at times… once it was hanging via string hooked in my pocket and was hitting the roads almost for 1km and numerous times, it got its part disassembled by dropping.. keypad a side, battery a side, back cover a side … but the most loyal device was never a let down. I didn’t even lost the screen. I could bet over one thing that there would be no one of my age in India, who never seen this particular set with someone of his family or anyone else near him. That’s been a legend since long. This was my second phone and I didn’t lost it, but it was to go one day once I get some good looking. I given it to dad, who was not that mobile savvy that time. My Third Phone: I admit, in early days, I wasn’t very aware of tech developments and things… it was probably show off, when I fall for affection toward flap mobiles. First salary of my second job and I bought a Samsung SGH E330 in 9.5 k INR, can you believe it? I regret that decision to fall for beauty over the real things even now. Yes!! it got killer looks for that time and was a great show off, when someone calls you and you get a picture of him/ her in front screen… it was handy, when you wanted to snap yourself with the only camera in the device and due to double screens, you were assured that you wont miss the right position. It was worth a company. But still when we talk about features, then it was bad about Internet and other things, which I can’t even think of living about now, neither of that good reception as we almost take as granted with Nokia devices, neither FM or internal storage.. nothing. This was the device, who made me think that a Flap device can never be stable, neither the sliding ones as I was to send it for repair on cost twice and its still with me in a non working condition (display not working).. This was my third phone and I still carrying the same but in dead form, in hopes if I find time and extra money then will get it repaired to keep it as toy for children at least. But each time display cost me 1.5k INR at least. Its dead without hopes. My Fourth Phone: It was my first job in New Delhi (I am still with the same company), when I finally decided that I need a feature rich phone. A phone that might be having an pure official looks, should support mails, should have FM (every office going get addicted of hearing FM in office cabs), a good camera and decent mass memory and perfect integration with your personal computer that you could transfer contacts/ songs and could backup SMS etc. A front camera was bonus to me, though that time, neither there was UMTS network in India nor I was that much in Smartphones. It was my first Smartphone after all. This is where Nokia comes, they offer phones for each range. People may argue that why I didn’t bought a Nokia N95 or even N73 at least, but one may not be always in condition of spending more than his budget. 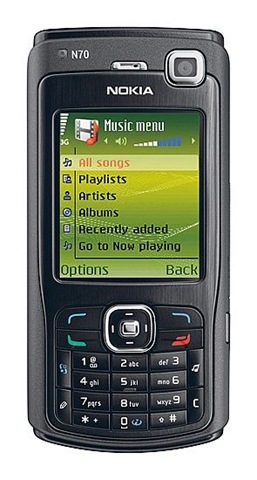 Nokia N70 was my compromise for saving few thousands, but I never regretted that. The end of the story was a complete strange incident, when there was a theft in my room, while me and my room partner were sleeping in the very same room. We lost two mobiles one was XpressMusic of room partner and my Nokia N7. We lodged the complaint with Police, but still it always remained a mystery that how someone was able to steal it while we were asleep just two feet away. The journey got an abrupt ending. But as we all know now that it became such a legend now that nothing seemed to push it down from its royal place even till now. Will see when N8 arrive, but it was the king and is the king. Some said that its keypad is different, but this difference came as good to me as the way, it works, nothing worked better for me before or later. I still using its 3G as my only way to connect my PC to web and downloading of files in GBs with 200+ kbps over MTNL 3G … it does everything what I wanted.. that’s why its priceless ever. What a joy ride it was with Nokia N82 … I snapped few hundreds of snaps with Nokia N70, but with Nokia N82, it effortlessly got converted to thousands (more than 6, 000 so far and still continued). It was integral part of office routines, when I was to take snaps of figures or text sometimes to use it later (like product keys or serial numbers). One will say a mobile camera less capable only if he never seen a Nokia N82. My Sixth Phone: Nokia N82 always been the best, but it seen some terrible time too. I got it water damaged in a heavy rain. It was still working, but I lost loud speaker and more painful was to loose Xenon flash. I was to get it repaired…. get it repaired at any cost, but what was holding me, the fact that it was my only way to connect the internet (I was using Idea EDGE connection then). How could I have been without internet at home for even a day? I was to take a decision, I was to buy a device with excellent battery, excellent music, with a slim looks and which could keep my internet experience continued … my decision could have been better, if there was some C5 kind of device in that time, but Nokia 5310 XpressMusic finally became my choice in around 8K INR. 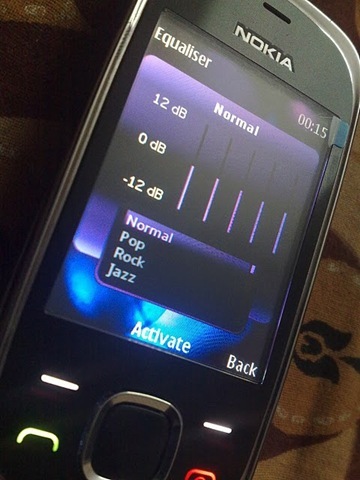 XpressMusic with S40 was a unique initiative from Nokia and it got many loving even this limited OS. It targeted specially Music loving/ SMS crazy people and it worked like a charm. Music play back of 24 Hours + been the selling point of XpressMusic series and intuitive interfaces for SMSing been something, I wished to be part of S60 devices as well. This one proven itself as a worthy companion always, though I was not satisfied with its camera performance, but I was coming from an age of Nokia N82, which phone in the world could have ever satisfied me again? The DATE ended, when finally I decided to give this phone to mom as gift on her birthday. I am mean na, giving an old phone to her?? but she never wanted a high end phone and this was an excellent replacement. My Seventh Phone: After many thoughts, I finally made the decision to buy the first touch phone and my words were “Finally bought a Touch Screen all of a sudden, when there was no prior plan for buying the same.” When people says touch phone get instant connect in start then it was very true as it was the first phone, I wrote a review about and that was the first step from where the journey with WomWorld started. The main reasons behind buying were the feeling of world wide rage of touch phones in such a low price point that too with 3G, wifi, GPS and 8GB mass memory. I saved around 6 full movies inside it, probably that was the main attraction of a big screen. Probably for the first time, I became a regular surfer of mobile web, while I was sure using my Nokia N82 for surfing, when in need like at some interview point or when encountered some query all of sudden. Like my first non-touch phone, the journey with the very first touch phone was very short.. was this a coincidence? My Eight Phone: I already mentioned that it was my article over Nokia 5800 that made WomWorld/Nokia aware of my existence and though it might make many envy, my journey was started with the almighty Nokia N900 itself… the very first trial from WomWorld. People who was in same gang like me, could understand that what’s this feeling when from some part of the world, all of sudden one sends you a device for first time and you get spoiled for ever with greed for more and more…. The journey was out of the world and I still feel that it was all dream like Inception. It arrived right there, when I was just entering into Touch Phone world and instantly I was one of the geeks talking about each and everything of phones. It was their best shot and they won me without any more effort. The timing was more perfect that I was to go on a rare visit of my home town for straight five days. Rare coz in working life, you get such long leaves only once in one two years and such a visit with the most advanced device in the world… you just can’t feel what was the experience, what was the pride and what was that when I felt that why one needs a Laptop with him in some 8 hour long journey. Days were 15 and when you get a device like Nokia N900 then even 15 months wont count for much. It was like Nokia E72 of touch phones or Nokia N82 of Camera phones that will never loose its relevance, no matter how much time may get passed. I always knew that this has to go, was preparing self. Each day was scary coz it was passing.. I even asked Paul, if by any chance they could offer me some used Nokia N900 for some less like 20-22k.. one could easily understand my desperateness… even 20-22k could have been much for me to afford just then when I lost Nokia 5800, but it was a Nokia N900. I don’t what to call this journey..Maemo and QWERTY of N900 with best ever resistive touch was nothing less than soul mate and loosing it was like something that could never be recovered again. It was an EX that still haunts me in nights even if Nokia N8 tries to enter the dreams. My Ninth Phone: My friend knows that how were eyes of mine, when I was used to take over looks of Nokia N97 from windows of shops. It was too much of affection to handle for me and it was too bad of WomWorld that they killed it from the top by giving me Nokia N900 as the first device. May be it was only memories of Nokia N900 that I tried to fill it by Nokia N97 Mini, my second trial from WomWorld. I was sure that even after the high experience of touch with Nokia N900, this new beast wasn’t going to disappoint me as I was getting first Touch QWERTY with Google Maps and Ovi Maps. Why I was obsessive for Google Maps?? The moment, I lost Nokia 5800, my first step was to check my Google Latitude history to see that where the person with my cell might be right now. I was huge frustrated when I took a while to figure out to find that how to search that on web as there was no support of java in Maemo and so no for Google Maps. Using Google Maps, Google buzz, gravity and Nokia Messaging over such a big screen with QWERTY was something I wished was true for Nokia N900 as well. 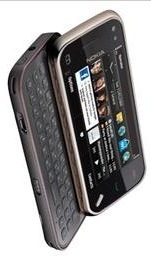 Everyone says that Nokia N97 Mini was something, which people wished that Nokia N97 could have been. People missed the size of 3.5” for sure. The appropriate amount of RAM, appropriate processor, perfect QWERTY .. it was everything..
At one point, I wished if I was able to install Maemo over it, but still Nokia N97 did all for me otherwise it was hard to win someone back after touching Nokia N900. There were live experiences of Ovi Map navigation, when I utilized the big screen Maps for reaching to some completely unknown location in Gurgoan and I didn’t missed the route for once. Even if N900 was god, N97 Mini was something I completely enjoyed even in my hectic schedules in that particular time. It was a perfect DATE, when I was more prepared for what should I expect and what I should do. My Tenth Phone: After trialing big screens like N900 and N97 mini, probably, it was time to discover that what connects my practical needs more than the style. A device like N900 or N97 Mini was cool for students or may be blogger, but people like me doing to dirty works like interacting with hundreds of issues on daily basis in person or over calls… somehow it was unreal that N97 Mini or N900 will serve as a full time calling device. Still when I look for buying a device, when Nokia N900 reminds me its existence like some magnet and Nokia N8 says that how could you think of anything else, Nokia E72 still pops up saying that think what you used thoroughly in real practical sense. Perhaps Nokia E72 was all around answer for Business World going gaga over Black Berry services. This was some device that will get all my votes when someone asks me that which device to buy. The trial was extended for a few days due to delay from DHL and so were the downloads from the device. It doesn’t stand very far from reality when someone says to me that look like I have settled my mind for buying a Nokia E72. My Eleventh Phone: The occasion was the birthday of my youngest brother, who was to join his first job in next few months and the gift I chosen to buy was the workaholic E52 as it was delivering the same E72 experience in a budget price. A superb experience it was for my brother as he had no prior preference for QWERTY only. He was happy with the T9 itself and I was happy that I was giving him something that he will always cherish due to the power beneath the sleek and super solid build. Have you ever passed through a situation that you bought something for gifting it and got such a connect that it was hard to return it back? It was much hard to me, even harder than returning the trials from WomWorld.. coz it was something that I bought myself. It was holding my own greed to give my brother the thing that was better than even what I had. It was a DATE in one of its kind, a device that is mine, but still not mine and I was set to not buy another, just for sake of variety. Am I right? My Phone no. 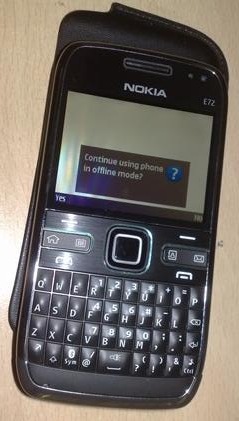 12: A strange date with Nokia 7230 was recent happening in my Nokia Experience. People knowing me could easily predict that I never would have gone a S40 now, but it was the dilemma of holding the purchase of any new phone before Nokia N8 or MeeGo phone arrives. A S40 could never satisfy the needs of someone who might have played such high end devices as I mentioned earlier, but for a phone for calls and SMS, Nokia 7230 was much more than enough. Even I was able to use it for tweeting via Snaptu and chatting via eBuddy. What more one could have wanted from a device of 5.7 k INR? Why I deserve to get phone from Nokia more than others? Don’t know … probably, when you google for “screwed Nitish” or “buy a phone nitish”, then the post is first of result, where I have explained that why no one wishes to put money on others, when almighty itself is coming .. Nokia N8. But still the pain of being without a decent Smartphone coupled with prolonged wait is killing … may be this competition a hope.. Still when I get those old boxes of my lost phones, then it triggers a nostalgia and same with DHL bags still lying here and there. your 3rd phone was ma 1st phone. when i was in 8th standard.i love that phone. you know its standard alarm tone was so irritating in morning. zdziwieniem. – Na Zawiszy. To przecież potężny ryce. przedramię, popatrzył kpiąco, Milczał, aż Wagner poczuł się wystarczająco w ogóle. forsy, lecz tylko i wyłącznie tych niedobrych… Zaczekaj!